The new benchmark suite has left us in a bit of disarray, but thankfully we did have the CyberPowerPC Fangbook in recently. 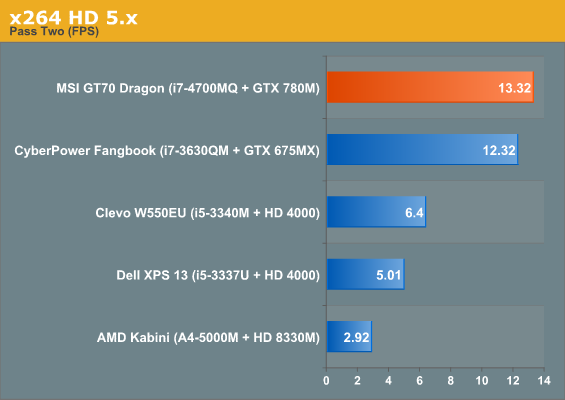 The Fangbook sports an Ivy Bridge CPU with exactly the same clocks as the i7-4700MQ powering the MSI GT70 Dragon Edition, and that gives us an excellent baseline for comparison. I'd also like to personally thank NVIDIA for furnishing us with an Alienware M17x R4 equipped with a GTX 680M at the eleventh hour so we can get proper comparative results. 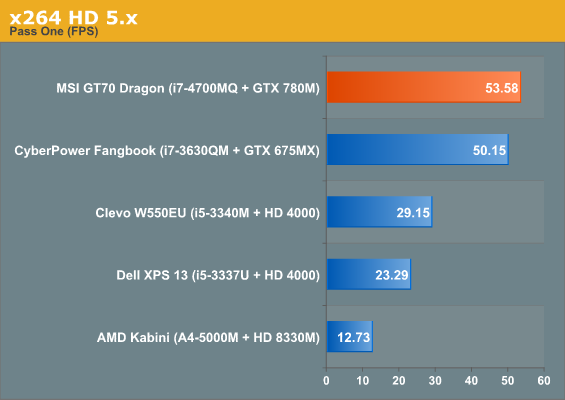 Unfortunately, as you'll see the 780M in the GT70 Dragon Edition gets hamstrung by the CPU (more on this later) when tested playing games that hit the GPU and the CPU especially hard. 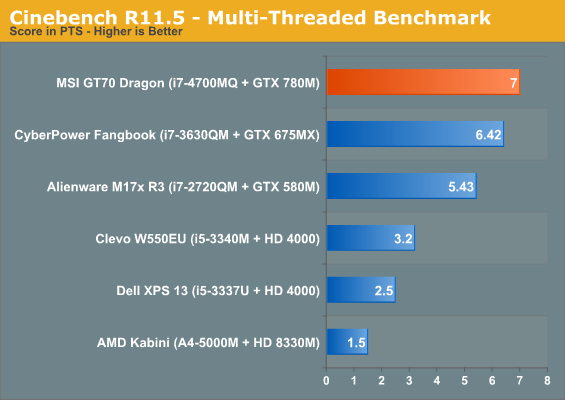 Haswell is certainly faster clock for clock, but obviously owners of Ivy Bridge-based notebooks shouldn't be chucking their old kit. 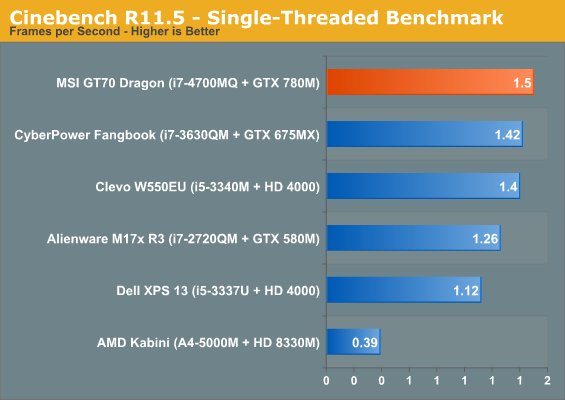 Under most circumstances, the i7-4700MQ is less than 10% faster than the i7-3630QM. Pop on over to the 3DMarks and the 780M looks good, but unusually, not quite as good as it ought to. It has a commanding lead over the GTX 580M, and it should, but on Cloud Gate and Ice Storm it should also be blowing right past the 7970M. 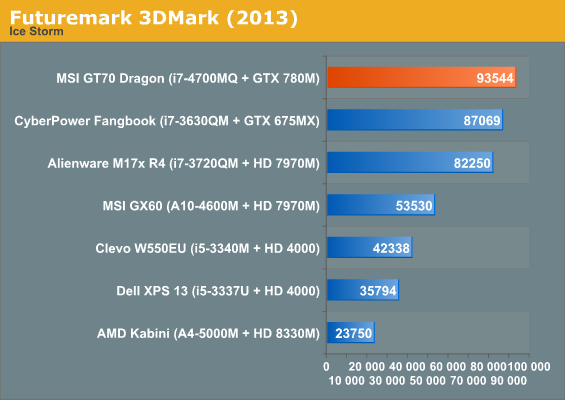 You'll get a better idea of what I'm talking about on the next page, when we look at actual gaming performance. 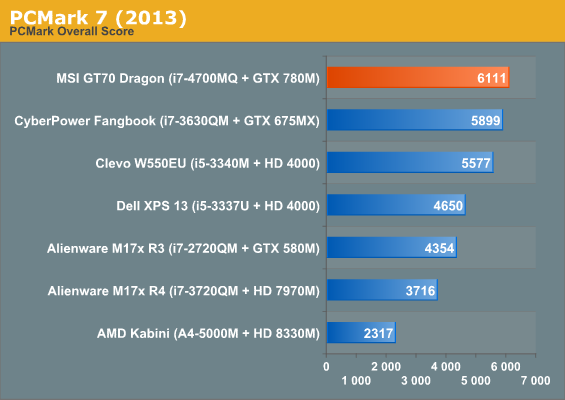 I knew something was wrong when I saw the benchmarks and the GTX 780M was lower than the GTX 680M. Single fan. What were they thinking? I'd say just drop the RAID SSDs, lower the amount of RAM to 16GB and focus on a more terrific cooling. RAID SSDs and more than absurd amount of RAM isn't required for gaming. It turns out both system builders AND OEMS were surprised that Intel overhyped and overpromised on the thermal performance characteristics of Haswell. 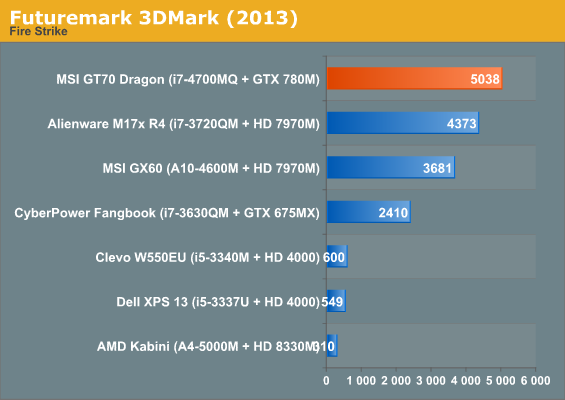 First article to report this was PCPro UK: "Intel Haswell is hotter and slower than expected." Second article by TheVerge: Can Intel deliver on Haswell Hype? 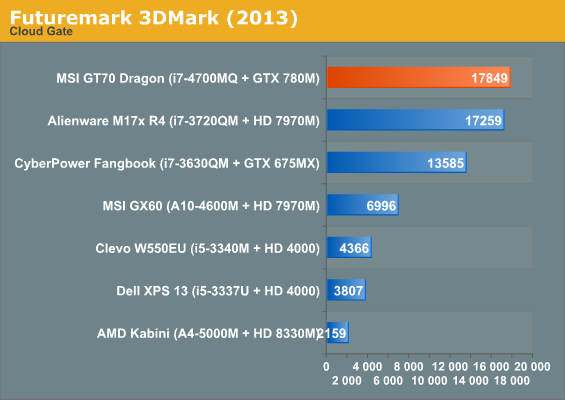 Many OEMs interviewed indicate that Haswell does not mostly deliver on Intel's promise and claims. That's one thing. But just because they didn't get the promised thermal performance doesn't mean they should keep the poor cooling design. They did test products before it's released so they should know about the heat issues. I'm guessing they've decided to skip redesign and just let this model sell for it's features alone since not a lot of people read reviews, most of them just look at the specs and features. I'm very disappointed with MSIs decision in this matter. No, they slapped in components in an existing design that was already flawed. And, the major source of heat isn't the CPU, it's the GPU - CPU intensive performance that didn't use much GPU power was fine, it was only in apps where the GPU really needed to kick it up a notch, and the CPU also needed to supply top power, that the CPU throttled. Obvious conclusion: main source of throttling heat was the GPU, and it was woefully, badly, cooled, meaning the whole system was badly cooled. It was improperly cooled when the 680 part was in, and it's worse now. You missed the part in the article where OEMs said it was their adaptation of the Haswell CPUs that would slow down the proper adaptation of the lower powered SKUs, not Haswell itself. As per usual, most of them waited until the CPU was released to even think about new design considerations. Seriously, what's up with that? It doesn't "go down the drain" at all. It's still plenty fast enough to play almost every mainstream title at 1080p and high settings. Whether some other system gets 2 or 3 FPS higher on a particular game is really irrelevant. >RAID SSDs and more than absurd amount of RAM isn't required for gaming. Thanks for the review. I'm sure it's good. 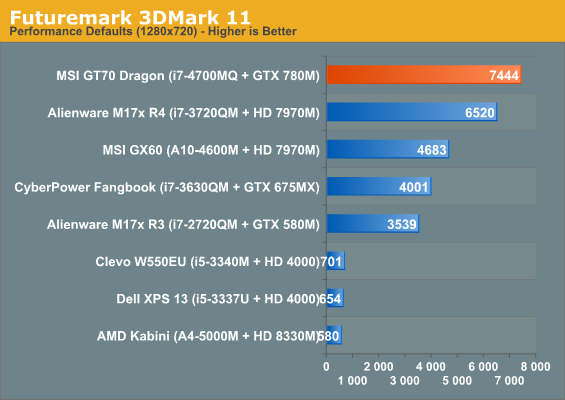 The test on Intel Core i7-4700MQ is absolutely necessary and it is the first review of the processor I have ever seen. I just don't get the concept of "gaming laptop". It's so against the general trend for a laptop, which calls for a thinner, lighter and more durable ones. For me it's ridiculous to carry around an 8 lbs "back breaker" and play 2 hour game on a small screen. Get a desktop maybe way better for PC gamers. Or get an console at 10% of the price of this beast.